Ceviche is a Peruvian dish made from fresh raw fish marinated in citrus juices, usually lime and spiced with herbs like chilli peppers. Ceviche is an old tradition in South America used by the Incas to preserve their fish with fruit juices, salt and chili peppers. The Spanish conquerors later introduced the lime, which is now more commonly used. The fish will essentially be “cooked” by the lime juice. The citric acids in the juice alters the fish's protein structures, just as if it had been cooked with heat. It is therefore important to use the freshest and cleanest fish possible, which will largely depend on where you are. If you're by the coast, like in Lima, then sea fish like sea bass is common. If you're in the mountains, like in Cusco, then river fish, like trout will be most fresh. If however you're shopping in Sainsburys in London, you'll most likely find salmon the most fresh fish to hand. This is why we've altered this recipe slightly to suit the type of fish we'd find commonly in the supermarkets back home. Also, best accompaniment to a Peruvian ceviche? 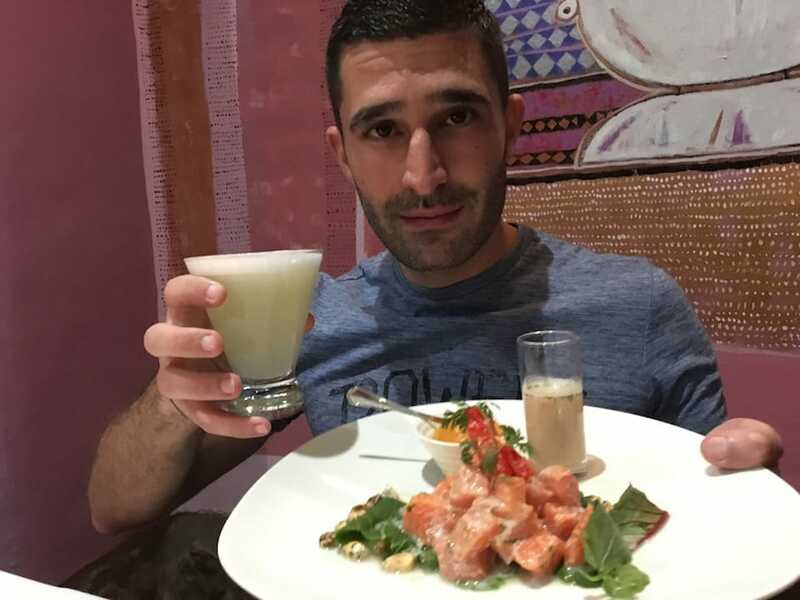 A Pisco Sour of course! 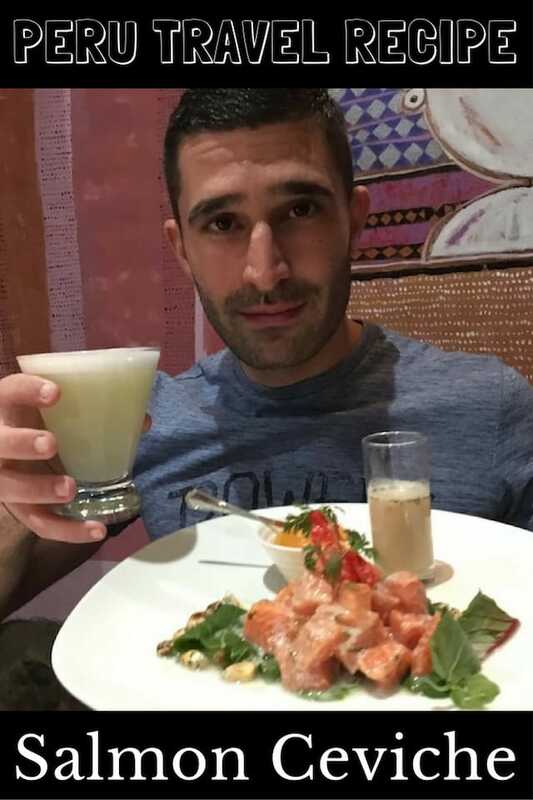 Stefan about to go face down into this yummy Peruvian ceviche in Lima with Pisco Sour to hand…CHEERS! 1. Mix all the ingredients in a bowl. Ensure the salmon is cut into small bite sized pieces. 2. Cover bowl and put in the fridge for a few hours to marinade. The longer you leave to marinade, the longer the fish “cooks” in the lime juice and spices. 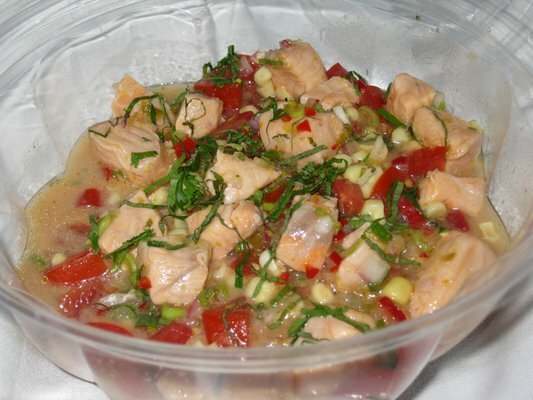 Salmon ceviche makes a delicious side or lunch main, guaranteed to always impress. It is traditionally eaten around South America at lunch time, using the fresh fish caught from the morning's catch. A good ceviche restaurant (cevicherias) will close after lunch as the fish caught in the morning is no longer fresh by afternoon. Hey dear Stefan Arestis, Thanks for sharing this healthy and tasty recipe dear. i cooked this love to eat man its really amazing my friends also love this dish. Great article on an amazing dish! 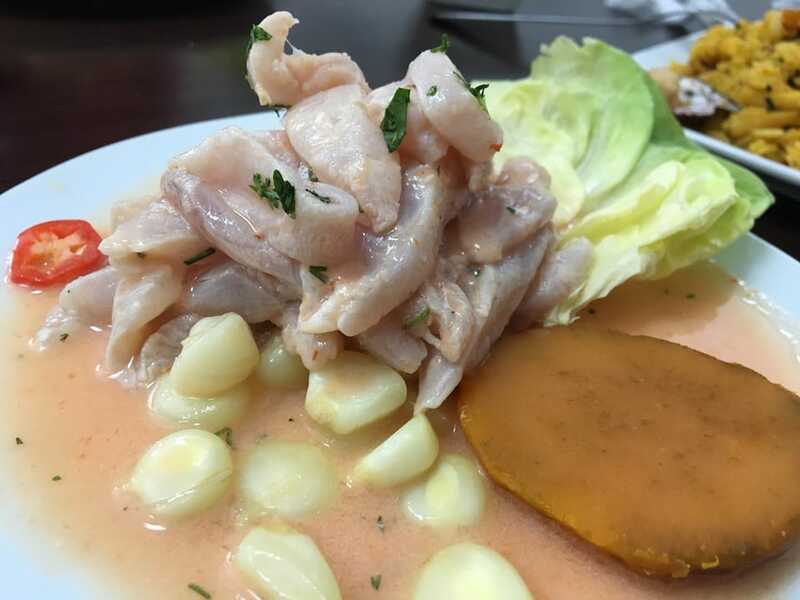 Travelling in Peru led me to Huanchaco where I took the plunge and ordered a plate of ceviche…Guess what I never looked back, I was blown away by how superb a dish it is!